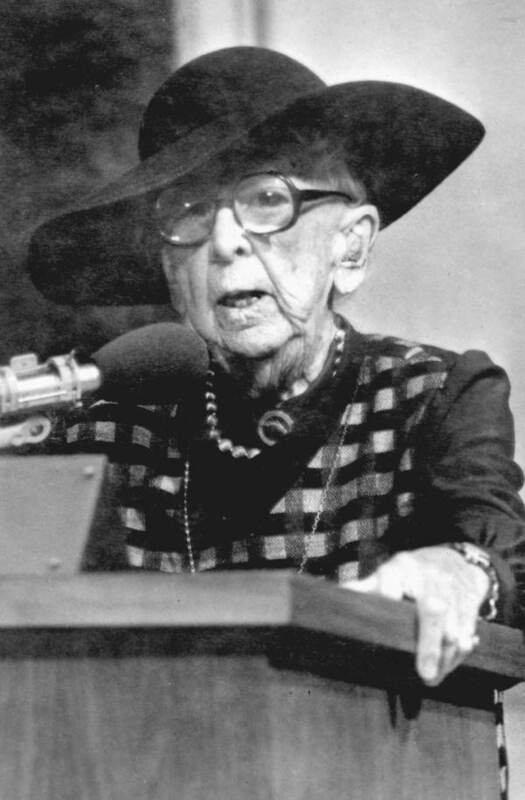 Marjory Stoneman Douglas’ (1890-1998) name is synonymous with Florida environmental activism. The Minnesota-born, Wellesley College graduate came to Miami in 1915, at age 25, to work as a society columnist for the Miami Herald. Her father, Frank Stoneman, was editor-in-chief at the time. She spent a year in the Navy at the reserve headquarters in downtown Miami but left to join the American Red Cross and moved to France in 1918. Upon her return to the States, she was hired as the Herald’s assistant editor and oversaw the editorial page and a column called “The Galley.” Her column focused on gardening and landscaping as well as women’s rights issues, Miami race relations, and urban development—something quite progressive for a woman to be writing about during that period. In fact, Douglas traveled to Tallahassee in 1916 with Mary Bryan, wife of three-time presidential candidate and lawyer William Jennings Bryan, to advocate women’s suffrage. She would continue her campaign for women’s rights through the 1970s and the battle to ratify the Equal Rights Amendment (equal rights for men and women under the Constitution). However, the amendment did not gain the necessary number of states to pass ratification on June 30, 1982. Douglas’ landmark non-fiction novel The Everglades: River of Grass, was published in 1947. The work was the first of its kind to bring public attention to the vast, unique wetland ecosystem. That same year the Everglades National Park was established. President Harry Truman made the dedication on December 6th with Douglas present at the event. Douglas founded Friends of the Everglades in 1969 as an effort to educate the public on the dangers of a new jetport development. The project would potentially destroy natural resources and habitats for various species. Douglas, along with the published report Environmental Impact of the Big Cypress Swamp Jetport (September 1969) by the United States Department of the Interior, was able to get construction halted after one runway was already built in Big Cypress. Today it is known as the Dade-Collier Training and Transition Airport, located approximately 40 miles to the west of Miami in central South Florida. In 1986 she was inducted into the Women’s Hall of Fame and in 1993 President Bill Clinton awarded Douglas, who was 103 years old at the time, with the Presidential Medal of Freedom. This entry was posted on Thursday, March 27th, 2014 at 1:09 pm and is filed under Audio, Big Cypress, Everglades, Photo Galleries, Preservation, Videos, YouTube Video. You can follow any responses to this entry through the RSS 2.0 feed. Both comments and pings are currently closed.